Soya Chunks or Soy Meat or Meal Maker are high in protein and a processed ingredient. Whenever I run out of vegetables, this soya chunks came out very handy for making the kurma. 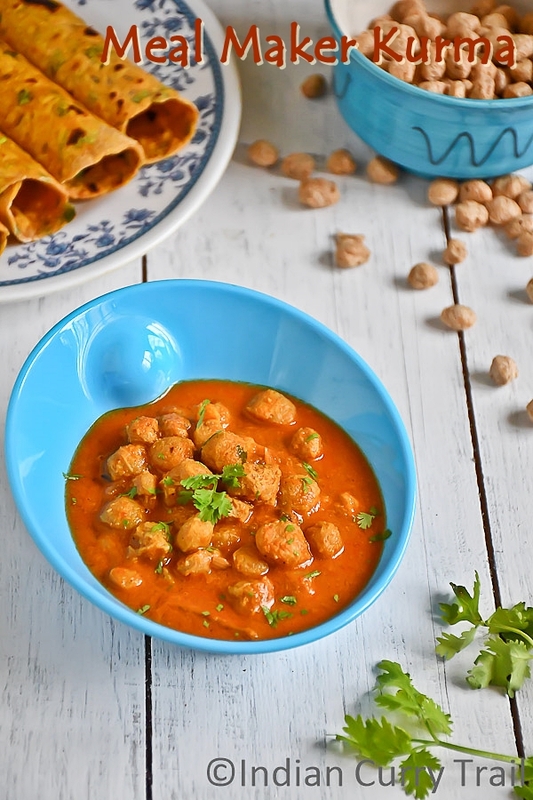 The procedure is almost similar to vegetable kurma but soya chunks are precooked before adding to the kurma. 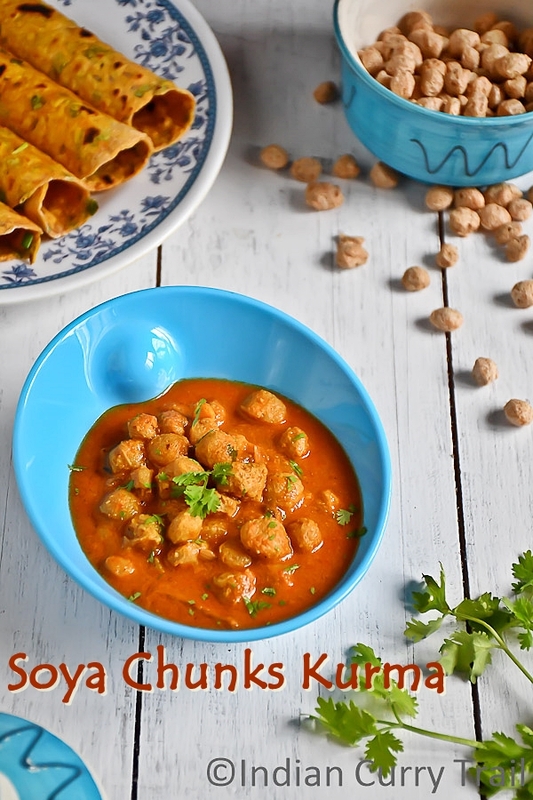 Here is the step by step pictures of making soya chunks kurma. 1) Heat water in a pan and add soya chunks when it is roll boiling. Keep it in hot water until cooked and pour the cold water into it once done. Keep aside. 2) Meanwhile in a Mixer, grind ginger, garlic and puree tomato and set aside. 3) Next, grind coconut, roasted channa dal and cumin seeds and set it aside. 4) Take a pan and heat oil in medium flame. 5) When oil is hot, add fennel seeds, cloves, cinnamon and bay leaves. Allow them to pop up. 6) Add sliced onions. Saute it till they turn translucent. 7) Add ginger garlic paste and keep stirring continuously. 8) After few seconds, add pureed Tomato and stir fry till the raw smell of tomatoes goes off. 9) Once the tomato is cooked well, add turmeric powder, red chilli powder, coriander powder, garam masala and salt. Cook till the raw smell goes off. 10) Now, drain the water from soya chunks and squeeze them well to remove the absorbed water. 11) Add the drained soya chunks to the pan. 12) Add the ground coconut and a cup of water or as required and allow it to boil. 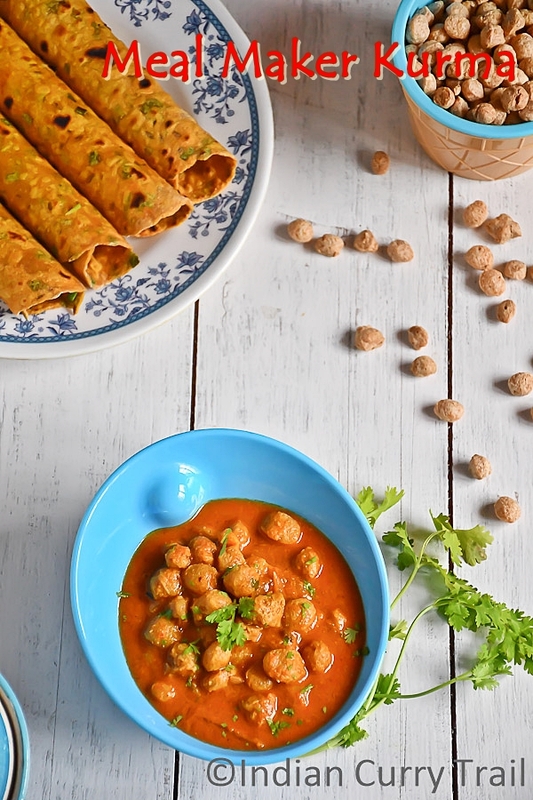 13) once the desired consistency reached, turn off the flame and garnish with finely chopped coriander leaves. 14) Soya chunks kurma is ready to serve with roti/chapathi. 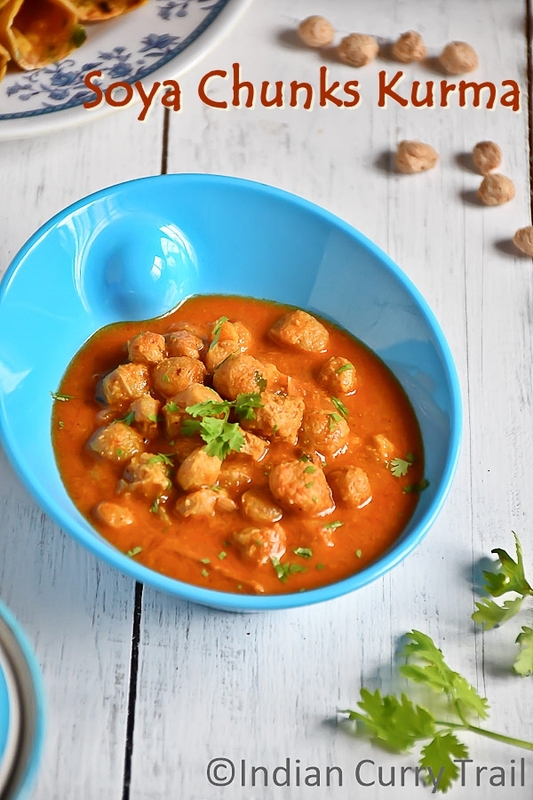 1) I used mini or small soya chunks for making this gravy. If you are using the big one, slice it into two and use in the gravy. 2) The gravy becomes thick when it is cooling down, so turn the flame off accordingly.